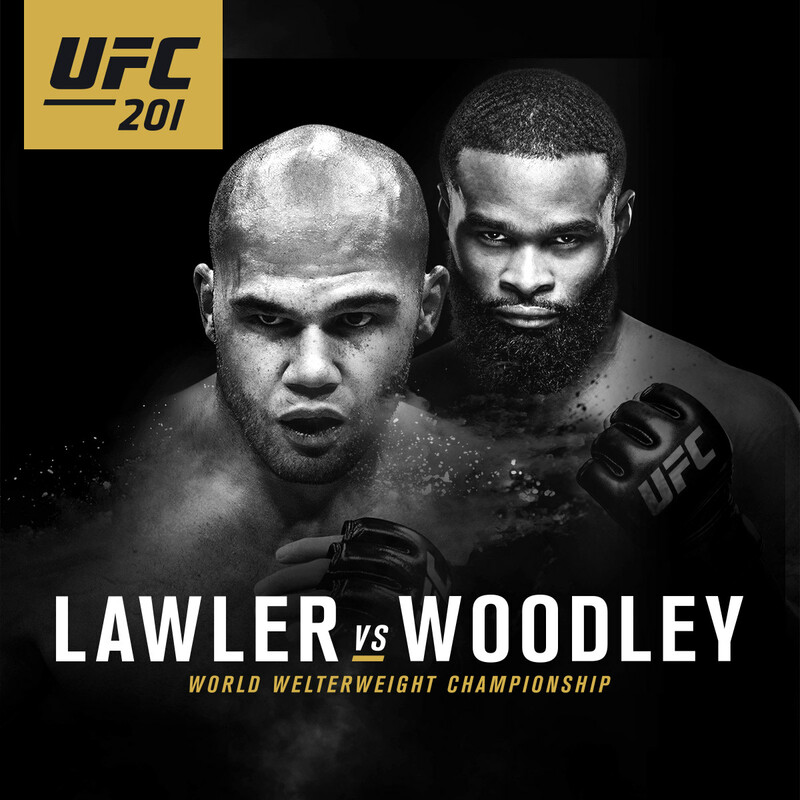 Welcome to F4WOnline.com's live coverage of UFC 201: Lawler vs. Woodley from the Phillips Arena in Atlanta, Georgia. This event is headlined by a UFC Welterweight Championship bout as UFC Welterweight Champion Robbie Lawler makes his third title defense, this time against challenger Tyron Woodley. In the co-main event, it is a potential title eliminator bout in the women's strawweight division as Rose Namajunas takes on undefeated Karolina Kowalkiewicz. They just announced Neil Magny vs. Lorenz Larkin as the Fight Pass main event for 8/20's UFC 202. That's a legit potential great match where the winner can advance significantly. First round: USA chants for Graves. Low kick landed by Velickovic. Body kick back by Graves. Low kick by Velickovic. These two have trained together in the past. Body kick by Graves. Velickovic with a few low kicks. Crowd is booing. Little happening. 10-9 Velickovic. Second round: Graves working for a takedown and got it. Graves has his back. Graves is trying to get a choke. Velickovic is trying to stand up. Velickovic tried to get up and now Graves is on top of him in guard. Graves has his back again. Graves is again going for a choke. Graves with a 10-8 round up 19-18 after two. Third round: Velickovic with low kicks. Velickovic trying for a takedown. . HJe took Graves down and got his back. Graves back up and took Velickovic down. Velickovic escapedand back to his feet. Body kick by Velickovic. Graves working for a takedown. Velickovic landing some. Graves pushed him around. Velickovic working for a takedown late but doesn’t have it. Close third round, I’ve got it Velickovic 10-9 here so a 28-28 draw. Obviously could go either way. Scores: 30-27, 28-28, 28-28 a majority, not sure who got the 30-27 but would have to be Graves. First round: Low kick by Sandoval. Hard right by Sandoval. Both swinging. Reis with a takedown and got his back. Nice takedown by Reis. Sandoval reversed to the top. Reis with a takedown and got his back again. Sandoval tapped out. They just announced a 9/24 show on FS 1 from Brasilia, Brazil. This was the second fastest heavyweight knockout in history, only Todd Duffee's seven second win over Tim Hague seven second knockout in 2009 at UFC 102. First round: Masvidal with a high kick. High kick and knee by Masvidal. Masvidal threw a kick and Pearson took him down off it. Pearson got his back but Masvidal back up and away. Masvidal with knees and elbows. Low kick by Pearson. Spin kick by Masvidal. Masvidal 10-9. Second round: Pearson throwing low kicks. Masvidal dropped him with a left and pounding him on the ground. Masvidal landing a lot of punches on the ground. Pearson is in a lot of trouble. Masvidal suplexed him into the cage and throwing all kinds of shots. Pearson up and escaped. Trading low kicks. Masvidal landing punches. Masvidal with a low kick taking Pearson down. Masivadal threw a kick but Pearson took him down off it, but Masvidal back up. Spin kick to the body by Masvidal. Masvidal with a left. Pearons with a low kick. Masvidal 10-8 so 20-17 after two rounds. Third round: Pearson landing low kicks and some punches. Masvidal’s right leg is a mess. Pearson landed a left. Jumping knee and body kick by Masvidal. Pearson with a left. Body kick by Masvidal and Pearson with a body kick. Close round, could go to Pearson actually. Masvidal 29-27. Scores: 29-28, 29-28, 30-27 Masvidal. Not one judge gave round two a 10-8. The scoring is so inconsistent. First round: Serrano is a high level wrestler but just starting out at 36 years old. Both threw low kicks is at the same time. Serrano nailed him with a roundhouse right. Body kick by Serrano . High slam by Serrano into side control. Benoit back up. Benoit dropped him with a punch and Benoit had a guillotine. Serrano took him down into side control. Benoit back up. Benoit with a right. Both swinging wildly. Right by Serrano. Body kick by Benoit. Ax kick by Serrano. Body kick and punches by Benoit. 10-9 Benoit. Second round: Ax kick by Serrano. Serrano with a sidewalk slam and now on top. Benoit back up. Serrano bleeding now. Serrano tried a takedown but Benoit moved away. Serrano took him down into side control. Serrano dropping his hip on Benoit’s face with is legal. Benoit back up just as the round ended. Serrano’s round so 19-19 after two. Third round: Serrano took him down right away. Crowd starting to boo. The ref stood them up as Serrano wasn’t doing a lot at the top. Serrano went for a takedown and got a knee to the face by Benoit who is now on top. Serrano back up. Serrano did a somersault Lucha roll. Serrano tried a takedown but Benoit escaped. Body kick by Serrano. Serrano crawled under his legs, so weird. Benoit jumped over him. Benoit with a body kick. Benoit landed a right. Benoit 29-28. First round: Rivera landed punches. Left by Rivera. Perez with low kick and body kick. Rivera threw a kick but Perez caught the leg and threw a few punches. Both trade d punches. Perez took him down but Rivera back up Rivera landed a good punch and Perez with a low kick and body kick. Good left by Rivera. Close round 10-9 Rivera. Second round: Both dancing around. Perez with a spinning backfist. Both missing. Body kick by Perez. Perez went for a takedown and didn’t get it. Rivera is bleeding from the right side of the head from a spinning elbow. Body kick by Perez. Perez tried a takedown. Rivera landed punches. Rivera landed a punch. Low kick by Perez. Right by Rivera. Perez got the takedown. Perez’s round so 19-19 after two. Third round: Both came out swinging . Rivera is getting the better of it. Perez dropped him. This was unreal. Rivera threw a punch and was so exhausted he went down. Perez took him down. Perez with an elbow. Perez landing a lot of body punches on the ground. Perez landing a lot of body punches. The fans are booing and wanting a standup. Perez landing more body punches. Perez landing more body shots. Rivera up but he’s exhausted. You could go 10-8 Perez 29-27. Perez has to win the decision. First round: Right by Namajunas. Not much happening. Nice left by Namajunas. Karolina landing some punches as well. Front kick by Karolina. Head kick by Karolina. Namajunas landed a nice punch. Karolina landing knees. Namajuans went for a hip toss and is on top Close round. 10-9 Namajunas. Second round: Knees and elbows by Karolina. Karolina with a knee from the clinch. Both in fighting. Karolina landing elbows. Both trading punches now. Namajunas landed a good shot. Karolina back with low kicks. Both landing punches. Front kick by Namajunas put her down. Karolina landed good punches. Karolina with a clinch and knees. Karolina with another rknee. Karolina so 19-19 after two. Third round: Karolina landing punches from the clinch and hurt Namajunas with a right that put her down. Namajunas tried for an armbar. Karolina with punches from the top. She spun to escape a leglock attempt and landed more punches. Namajunas with two up kicks. Namajunas tried a triangle but doesn’t have it. Karolina with more punches. Both trading punches as the match ended. Karolina’s round for sure 29-28. Kowalkiewicz will get a shot at Joanna for the title. She said she knows Joanna and respects her very much and said Joanna was the best but she would beat the best.